In the past three years heading to Interbike as well as CrossVegas has always proved to be interesting. 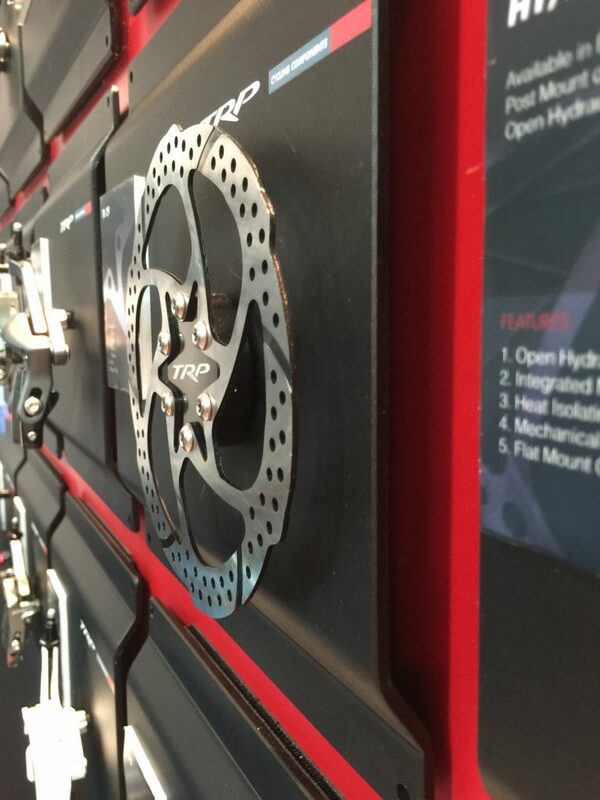 Interbike always has fresh and interesting gear and CrossVegas continues to be a fantastic and exciting race. This year proved to be no different. On Tuesday of CrossVegas week, Bill, Rusty, Bruce, and I headed out to Interbike’s Dirt demo. This being Rusty’s first time he didn’t know what to expect. So we walked a lap around at the entire expo event and checked out all the new gear. A few things caught our eye. I just spent the past two years living and riding in San Antonio Texas and needless to say with the exception of a couple of months over what south Texans call winter I always rode with both insulated water bottles as well as a third bottle I carried in my jersey pocket, not to mention having a bottle with me when I warm up for ‘cross races. So when we went by the Camelbak booth I was intrigued by their Quick Stow flask. Although Camelbak designed this with runners in mind, for those of us that live in hot environments or race cyclocross, this product is great idea. 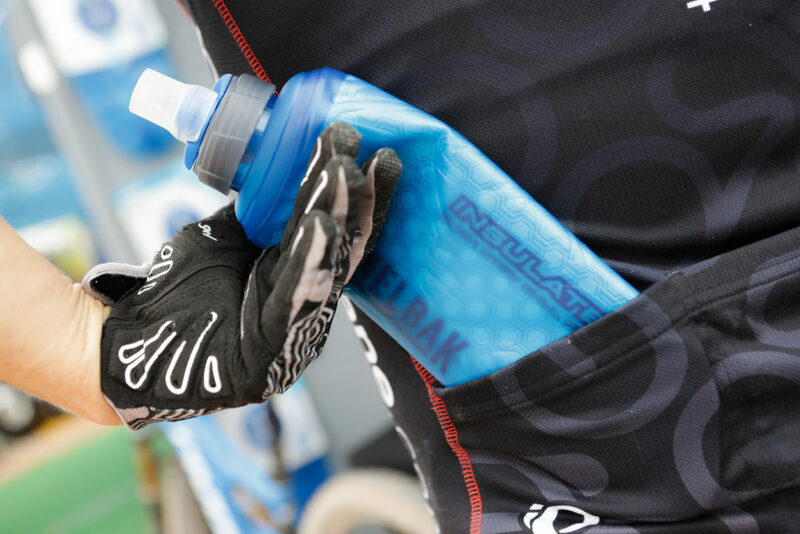 It is way more comfortable than a full sized bottle in the back pocket, won’t interfere on your warm up laps, and collapses down when you have drained it. After wandering around some more and looking for more interesting product we stopped by the Finish Line booth. 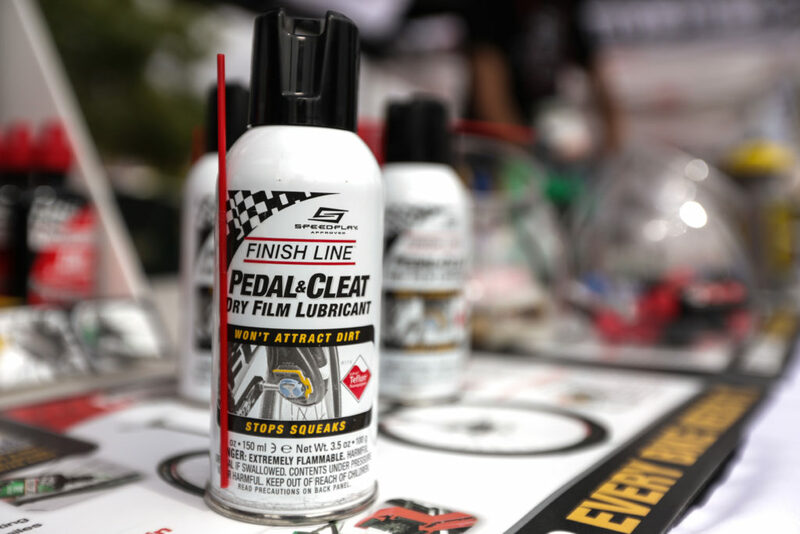 They have a product called the Pedal & Cleat Dry Film Lubricant. After seeing the demonstration this looks to be a great product for the cross season when the weather turns wet and muddy. In theory, spraying this on your pedals and your frame before a wet or a snowy race will help you clip in faster and save weight on your bicycle by not accumulating mud or snow build up. If you don’t have a second bike or don’t have a pit person taking care of your second bike this is a great option. The last thing about the Outdoor demo that doesn’t have anything to do with cyclocross, which you may have seen in Bill’s ITCH Tour video was that we had the chance to ride around on E-mountain bikes on the Bootleg canyon trails. I don’t think that I would ever buy one, but it sure was a load of fun and I haven’t laughed that much on bicycle in quite. Just don’t let your battery die. 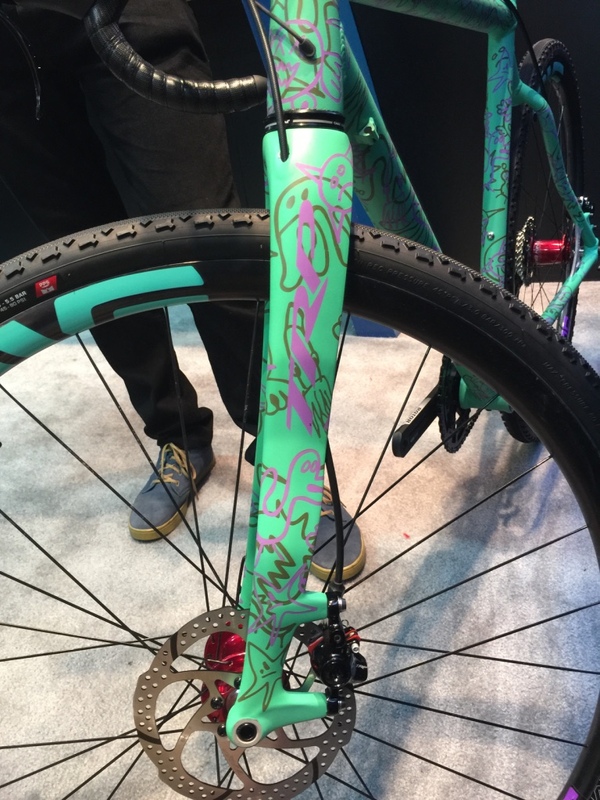 Interbike is an almost overwhelming experience. If you don’t go in there with a plan you can wander around for days and still not see everything. Although I didn’t go in there with a schedule, I did go in with an agenda of checking out products that I thought were interesting or were relevant to cyclocross. To start off, we stopped by and had a quick chat with ITCH Tour Title Sponsor Orange seal. Having used orange seal to seal up some FMB tubulars last season I know that the product works but hearing the science behind it always interesting. I had the opportunity to chat with Orange Seal Cycling president John Vargus who gave me the lowdown on the range of products they have to offer. Squid bikes is also a sponsor of the ITCH Tour so when we dropped by the TRP booth we had to check out the Rattlecan they had in the booth. 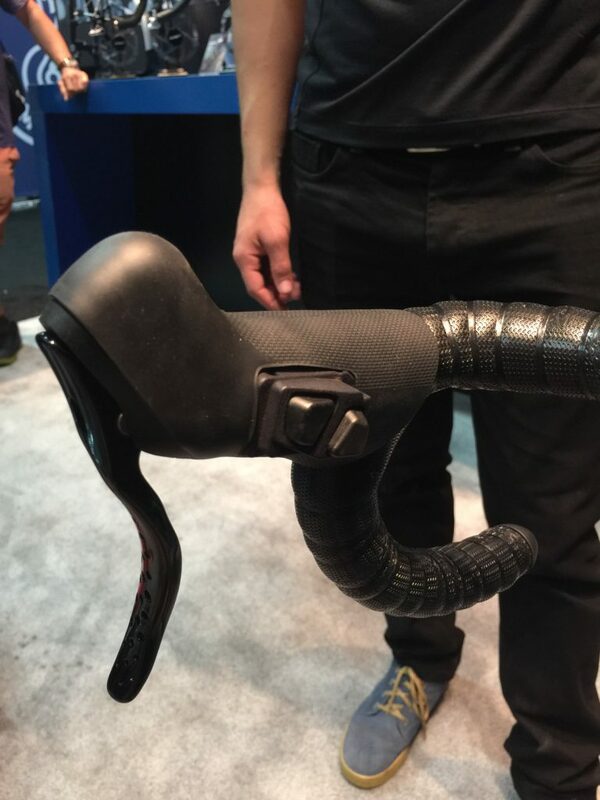 From the Shimano Di2 climbing shifters incorporated in the brake levers to the new TRP fork that routes the front brake housing thru the fork leg it’s a pretty awesome build on a great looking bike. Rattle canned to perfection. A Squid Bikes selling point. 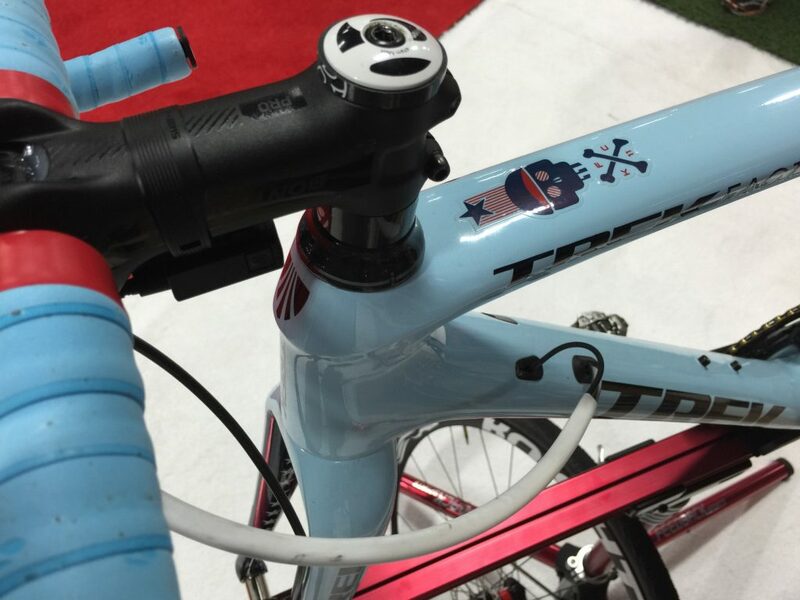 Di2 shift buttons on this Squid Bikes model are incorporated into the TRP brake levers. Check out the cut outs on the TRP rotor used on the Squid Bikes show build. The design is intended to shed mud/snow and decrease clogging. As a cyclocrosser I obsess over tires. Always have and probably always will. 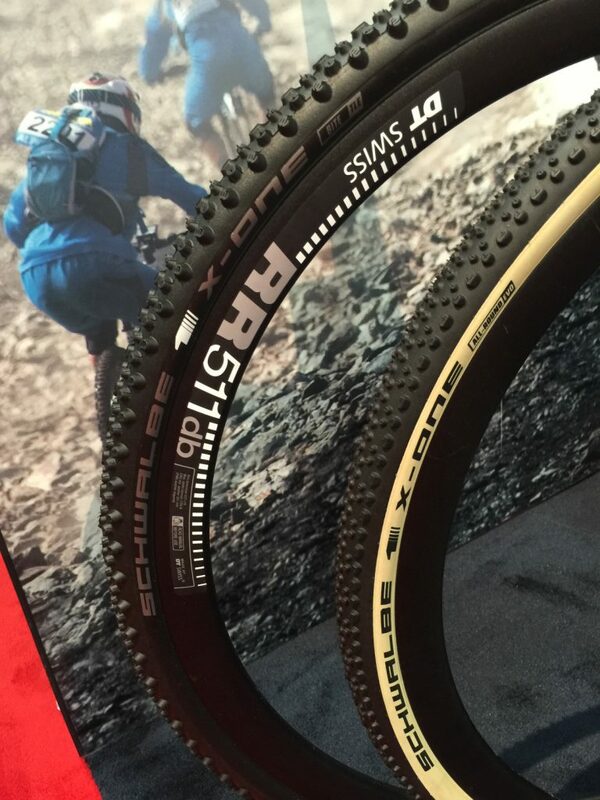 Both the Clement as well as the Challenge booth had new offerings this year with the Challenge Dune sand/snow tire and the Clement BOS mud tire as well as offering a couple of their tires in tubeless, clincher, and tubulars. 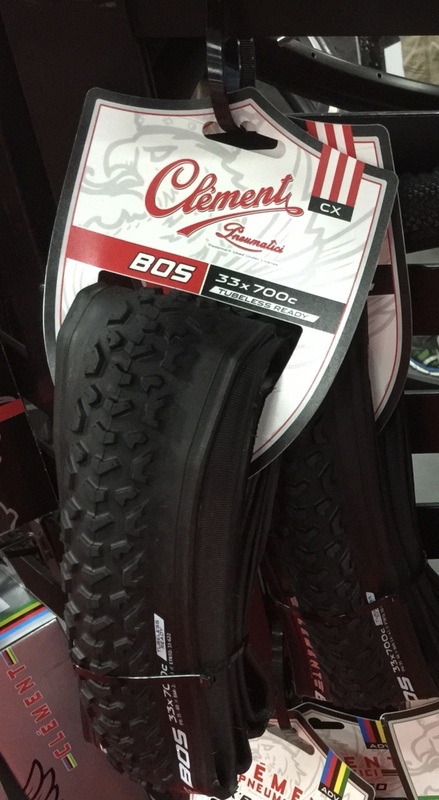 The new Clement BOS is a deep mud tire with taller lugs that should improve traction and mud shedding. Named after the Boston, Mass., airport code, this tire may be perfect for the slop of fall and winter. The BOS (along with the PDX and MXP) also comes in a tubeless compatible option, a first for Clement. The Challenge line up from top to bottom. 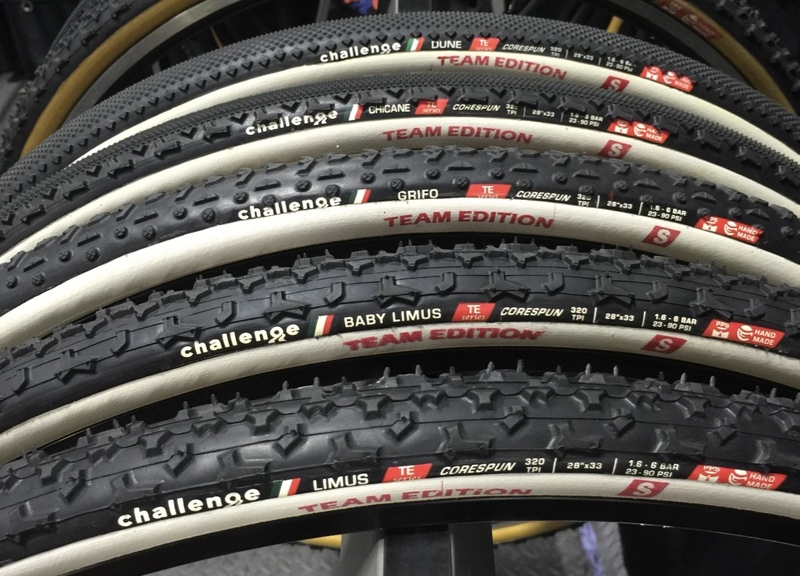 Dune, Chicane, Grifo, Baby Limus, and Limus. The team editions have a new coating on the sidewall and a different rubber compound to make them grippier without sacrificing durability. Challenge is calling the Dune an all around gravel tire. I’ve been riding on the Schwalbe X-One tubeless tire when I have been hitting the trails lately and wanted to check out the tubular version as well. Kenda also has a new mud tire as it extends its tubeless-ready line up. Schwalbe’s X-One tubeless tire has an old school cyclocross look, lightweight yet durable sidewall and may be best suited for your gravel riding needs. 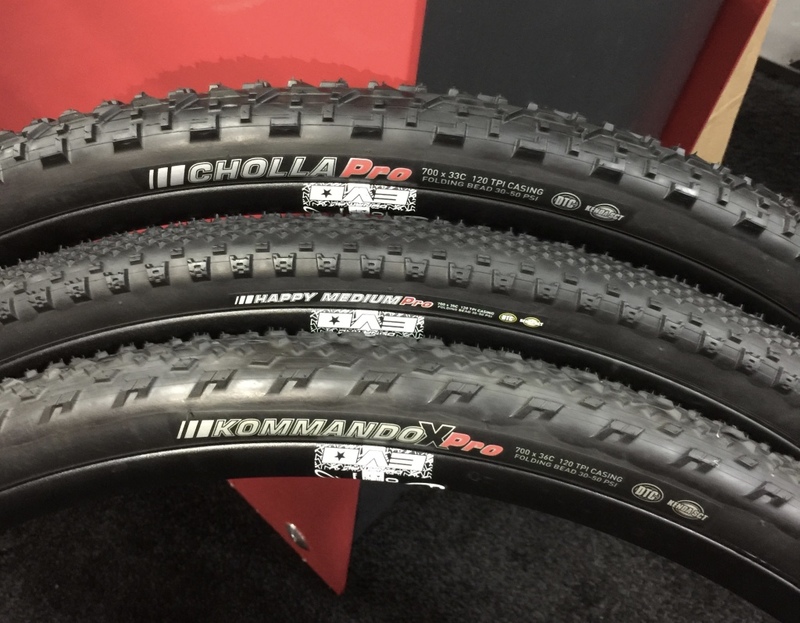 Kenda’s Cholla Pro mud tire is the company’s newest offering and comes tubeless ready. 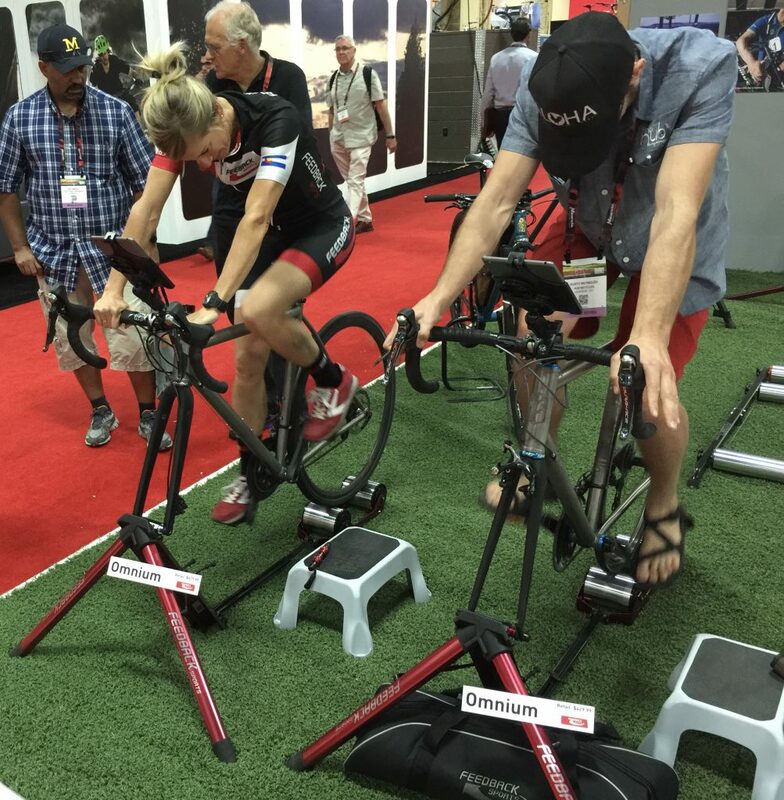 Last year when I was at Interbike I saw the Feedback sports Omnium trainer. This year I had the chance to ride it at the show. Even though this product has been available for a number of years I am not sure how it stayed off of my radar for so long. This thing is fantastic. I love how portable it is and the ride quality is second to none, even when riding with a knobby tire. 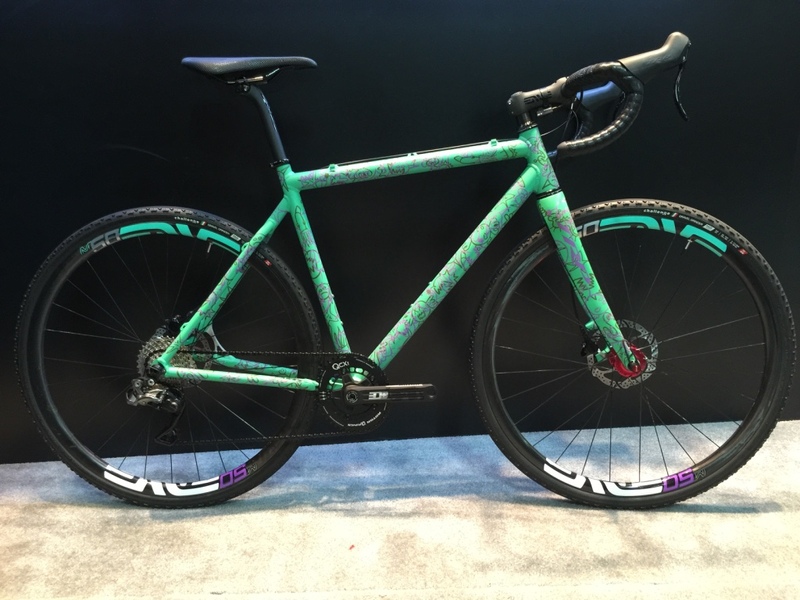 While in the booth I also had the chance to check out Katie Compton’s current ride from Trek. Katie’s mechanic Mark Legg Compton’s extra touches to her bikes take it above and beyond. The attention to detail with the heat shrink-wrap on the cables and brake hose as well as the dots of glue on the electric shifter paddles is fantastic. You can’t really see the dots in the photos but for when the weather turns colder and wetter and you are wearing gloves it will make it very easy to find which shifter paddle is which.